The Kirby Flat Gold Mining Diversion Sluice consists of a 30 metre long stone embankment, pebble dumps and quarried bank. The sluice was probably built in the mid to late nineteenth century when the flat was extensively worked by alluvial miners The embankment was used to divert the waters of Yackandandah Creek through sluice boxes, with the eastern bank of the creek being mined for its alluvial gold. The Kirby Flat Gold Mining Diversion Sluice is of historical, archaeological and scientific importance to the State of Victoria. The Kirby Flat Gold Mining Diversion Sluice is historically and scientifically important as a characteristic and well preserved example of an early form of gold mining. Gold mining sites are of crucial importance for the pivotal role they have played since 1851 in the development of Victoria. Water diversion and sluicing are important key ingredients in an understanding of gold mining technology as it was employed in mountainous country where water was plentiful and perennial. 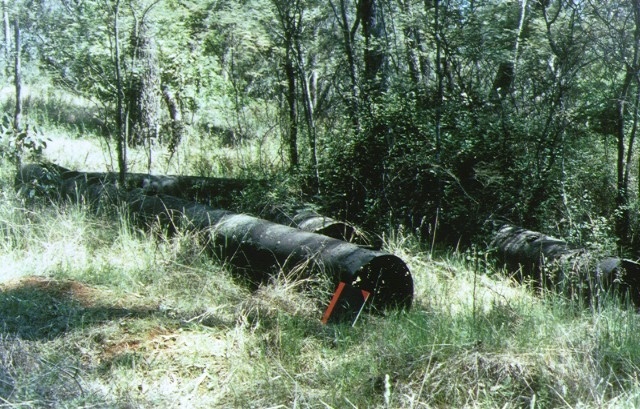 The Kirby Flat Gold Mining Diversion Sluice is archaeologically important for its potential to yield artefacts and evidence which will be able to provide significant information about the cultural history of gold mining and the gold seekers themselves. Kirby Flat Gold Mining Diversion Sluice, Bells Flat Road, (2.75 kms south-west of Yackandandah), Indigo Shire Council. 1. All of the Crown Land including the 30 metre long stone diversion sluice, pebble dumps and remains of alluvial workings within a 100 metre radius of a point with Australian Map Grid co-ordinates E842 N786 on 1:100,000 map sheet number 8225 Albury.